The RdlcRptGen Class, is a Class written in C# which accepts a DataTable parameter and then generates the necessary rdlc.xml file and displays a report, based on the DataTable, in the ReportViewer Control,. The RdlcRptGen Class can use as little as one line of code, or optionally additional properties can be set to control other elements of the report. (IE: Column header, Column Width, Selected fields, Report header, etc). 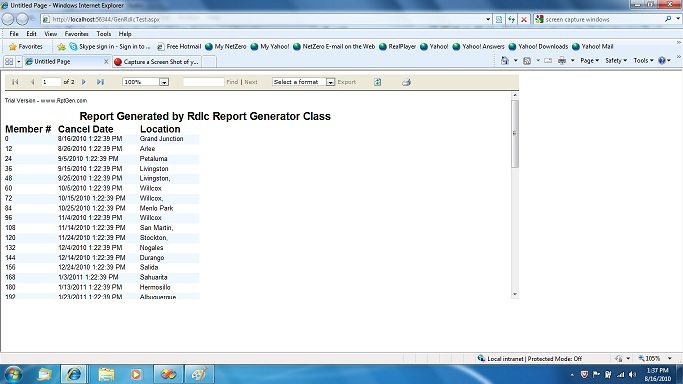 Generate local reports at run-time, using the Microsoft ReportViewer Control. Following is an example of the easyest way to produce a report from an existing DataTable. Prior to running this code the following action need to be taken. 1.Copy the RdlcGenClass.dll file to the bin directory of your project. 2.Add a reference to the RdlcGenClass in your project. 3.Create a DataTable named TestDataTable with the data that you wish to report. This can be done in several ways, please consult you help resources for additional information on how to create a DataTable. 4.Add a Microsoft ReportViewer to your form. You may need to add a reference to it in you project. Accept the default name of ReportViewer1 for the control. Small but powerful text editor and Notepad replacement in a single executable. Qweas is providing links to RdlcRptGen Class 1.5 as a courtesy, and makes no representations regarding RdlcRptGen Class or any other applications or any information related thereto. Any questions, complaints or claims regarding this application RdlcRptGen Class 1.5 must be directed to the appropriate software vendor. You may click the publisher link of RdlcRptGen Class on the top of this page to get more details about the vendor.